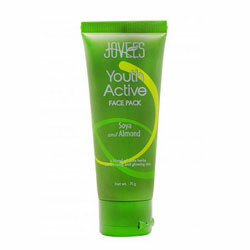 Jovees Youth Active Face Pack Soya and Almond help to promote surface skin cell turnover, mitigate fine lines by accelerate cell renewal process, improve skin texture, help skin to be firm and youthful. This youth active face pack contains argan oil, anti-oxidant and peptides along with other active ingredients derived from natural source that help to promote surface skin cell turnover, mitigate the fine line by accelerate the cell renewal process, improve skin texture and help skin to be firm and youthful. Clean face preferably with Jovees Citrus Cleansing Milk and pat dry. Apply a thick layer evenly all over face and neck. Leave on for 25 minutes. Wash thoroughly with water. Use twice a week. Follow with Jovees youth active face cream. Almond, Honey, Wheat, Argan Oil, Soya Protein.